All children are in need of great teachers, but the kids who suffer greatest – those with special needs – require the best teachers around. 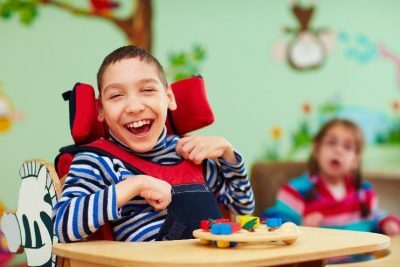 Special education assists students with varying disabilities—from blindness/deafness to developmental delays, to orthopedic impairments, and to autism—in gaining adequate knowledge and skill. Unfortunately, most special education programs in schools around the country are consistently underserved, with the result that most special needs children lack resources and manpower for sufficient instruction. If you are considering becoming a teacher, you should recognize that your impact would be greatest in the field of special education. To determine whether you are suited for this important and often challenging field, consider the following qualifications and traits, which special ed teachers need in spades. While some familiarity with subject, a bachelor’s degree in education, and occasional continuing education efforts might be enough for regular teachers, special ed teachers should aggressively pursue advanced education in their field. Understanding of physical, emotional and learning disabilities improves every day with new breakthroughs in psychology and medicine. Take autism: less than a decade ago, almost nothing was known about this condition; now, teachers can gain autism certification to more mindfully and effectively teach students on the spectrum. All teachers should be organized, but special ed teachers must be able to provide students with reliable structure, which requires better-than-average organization skills. Some ways this will come in handy are record-keeping for schools and parents, and classroom design to keep students on-task. For example, color-coordinating folders and trays and labelling different areas of the room will help students stay informed and focused. Students with special needs take more time to speak, make decisions, and perform other seemingly simple tasks. Thus, special ed teachers must have endless patience to allow students the required time to do what they want and what is necessary for their growth. Becoming frustrated with a student or doing something for them for the sake of expediency hurts the student in the long-term. Every student has a unique learning style, and this is especially true in special ed, where students are touched by varying disabilities, resulting in a rainbow of contrasting strengths and weaknesses. Therefore, special ed teachers must be creative in building lesson plans, so they can address every student’s needs adequately. In most cases, there is no cure for a student’s special needs – and many students wouldn’t wish for a cure, anyway. Special ed teachers should be accepting of the students in their classrooms, regardless of what disabilities affect them. Teachers should value their students, regardless of their size, shape or color, and they should communicate this value at all times. Often, students with special needs are non-verbal or else struggle to communicate in traditional methods. Sometimes, students will feel overwhelmed or frustrated and behave negatively without effectively expressing their feelings. Special ed teachers must be able to intuit the cause of poor behavior or otherwise understand their students even when typical communication fails. Similar to organization, detail-orientation is the ability to create and maintain structure. When students know what to expect throughout the day, they tend to settle into their routines and enjoy higher levels of engagement and success. Teachers must focus on the details of their daily schedules as well as the classroom environment to reduce the likelihood of surprises. Though special needs students thrive on routine, they aren’t skilled at creating routine for themselves. As a result, every day offers new challenges, such as outbursts, meltdowns and disruptions. Special needs teachers must be flexible, moving with and around these challenges, to both re-establish familiarity in the classroom and model proper behavior for their students. Special ed teachers can and will experience stress and frustration – often in spades – but they should never allow these feelings to overwhelm them or affect their classroom demeanor. An even temper is mandatory in special education, where even the smallest deviation from calm and controlled can result in chaos. While it can be easy to feel angry, sad or stressed by the conditions present in a special ed classroom, teachers must be able to see the light side of things. In fact, there is plenty that goes on in a special ed classroom that is uproariously funny, so a good sense of humor – which will show students how to turn negatives into positives – is a must. No teacher can be successful if they don’t love what they do. Because special ed teachers experience greater stress than the average educator, they must love their jobs and their students to continue being effective in the classroom. You know that becoming a teacher will help you change young lives for the better, so you should consider putting your energy and positivity in a classroom that truly needs you: special education. If you have any or all of these traits, you are suited for special education, and you can find immense satisfaction helping special students learn.